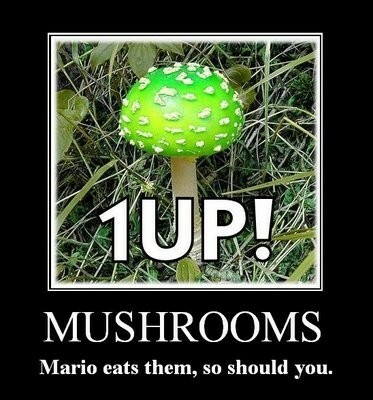 Do the mushrooms in the Mushroom Kingdom really look that tasty? So part of the reason I was MIA for the past two weeks of July was because I was following all the updates from Comic-Con. Comic-Con is no longer just about comics and the masses of unwashed dorks that attend. It now has become a mecca for all things related to dorkdom. Any chance that I can connect food and dorky goodness I’m all for. So when I came across this post in LA Weekly I’d thought I’d share it with you all. In the post it lists the top 5 absurd foods that were being marketed to dorks at Comic-Con. 1. Zombie Blood – right here this is already absurd . . . zombies are dead already, and their blood is coagulated they are either moving due to biological or mystical means, but they aren’t running on their blood . . . anyway, not sure if I dig a green drink from med pac. 2. Gamer Grub – I’ll admit I like to snack on salty, unhealthy food from time to time, but this stuff looks like it is geared to kids who are given controllers before they are able to talk so mom and dad can play the World of Warcraft. 3. Super Mario Snerdles Candied Fruit Stripes – uh, what is a snerdle? Anyway, with so many choking hazards who wants to get this other than a Super Mario collecting nut. 4. Mana Energy Potion – ok, I’ll admit it, if this stuff taste like Powerade or Gatorade I might drink it for exercising or energy . . . or a marathon session of gaming. 5. Zombie Flesh Jerky – and we are back to zombies again, I love the undead genre, but like anything overdosing on it is just dangerous . . . then, again zombies never die . . . I’d probably try a bite. 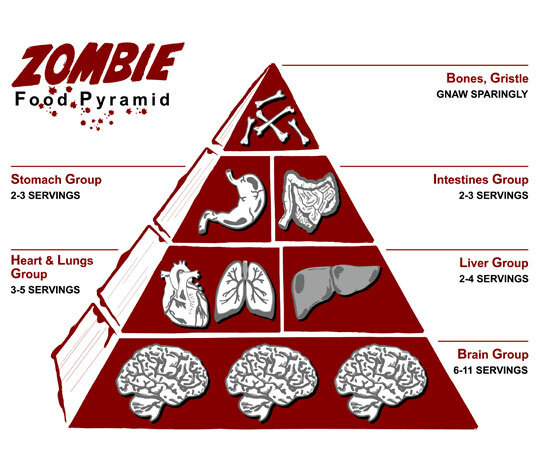 And if you weren't sick of me shoving zombie-related stuff on a food blog here is a zombie food pyramid! The HGC blog randomly showing you random combinations like zombies and food. Clearly, I am on a numbers and pictures kick (probably because I am too lazy to read anything lengthy). Anyway, here are 2 lists of Top 10 (or possibly just 12, but not “Top”) grouping of pictures that the author came up with to show you they can make connections amoung similar concepts and/or imagery. 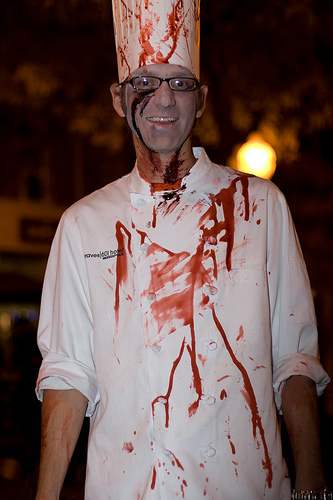 First up from LA Weekly we have Top 10 Brain Cakes: What Happens When Zombie-Lovers Bake. Why is there a need for “Top”? Why can’t it be just “10 Pictures I Pulled Off of Flickr because I Couldn’t think of Something to Write for this Week”? Anyway, I still like this list because I love cupcakes and zombies. I’m a fan of fusion or mixed genres whenever it is done in an amusing way. Anyway, let me blend this food blog with my video gaming hobby. Go check out Plants vs. Zombies or the L4D series if you like zombies. Next up we have Dark Roasted Blend’s series of pictures of “Quirky Kitchen Appliances with Somewhat Crazy Look and Feel to Them“. First of all I like the title, it rambles (kind of like how I do). Second, it has the toaster I bought my sister many years ago. It’s an awesome toaster if you like breakfast sandwiches. Thirdly, the aesthetics of dorkiness sceams that I must have one of these things in my kitchen. Anyway, expect the next post to be about food with numbers and possibly useful or entertaining information.